Will You All Please Cut Puig Some Slack! I've been reading everywhere about how disrespectful and arrogant Yasiel Puig supposedly is. And quite frankly, I'm sick of it. I think folks; including reporters, opposing players and baseball fans, need to take a break and try to understand the situation Puig is in. Yasiel Puig has literally come from a world sheltered by the rule of Castro's Cuba. Things like press availability, fan expectations, and western culture are totally foreign to him. And, I don't say that euphemistically. He could not possibly understand the world in which he is now the center of attention, and the culture shock he is experiencing is likely just as great as an aging WWII Japanese soldier still found hiding in the jungles of the Philippines 40 years after the end of the war. You have to remember that he has only been a part of the Western world for a little over a year. A YEAR! Like, literally! He came off a rag-tag boat a little over a year ago! So, cut him some slack! Following up on yesterdays post featuring an eBay vintage doll find, I now share a grouping of vintage fan-taken photographic snapshots of some Brooklyn Dodgers. Check them out below. This photo below is dated by the seller as being from 1951, and was taken during Spring Training. Featured in this one-of-a-kind photo is Rocky Bridges. He played high school ball in Long Beach and was signed by the Brooklyn Dodgers as an amateur free agent in 1947. He rose through the ranks and eventually played two seasons with the Dodgers before being traded to the Reds in 1953. Bridges would go on to have a 11-year Major League career. Here is a fan snapshot of first baseman Dee Fondy. The seller labels it as being Buddy Hicks, but based on some photos I've seen online I am certain that is not the case. Heck, I think the seller inadvertently mixed up the names as they have another photo (as seen at the very bottom) that is of Buddy. Anyway, Dee Fondy went to high school in San Bernardino and was singed as an amateur in 1946. He never played for the Dodgers, but would eventually get his chance to shine as a member of the Cubs in 1951. Fondy would go on to have a productive 8-year Major League career. BTW, the seller claims that the photo is from 1951, but that doesn't seem likely. He was traded by the Dodgers along with future actor Chuck Conners to the Cubs in October of 1950. So, at the latest the photo is from the Spring of 1950. This is the last fan-taken snapshot on eBay. Like the photo above, the seller mixed up the names. I am certain the photo below is actually infielder Buddy Hicks. He never played for the Brooklyn Dodgers, but was originally signed by them in 1944. He would eventually be sold to the Phillies in October of 1950; which lends credence to my theory that these photos have to be from 1950, or earlier. Buddy would finally get a taste of the big leagues in 1956 with the Detroit Tigers. He would only get into 26 games. Hicks would later on be a Minor League manager for both the Braves and Senators in the 1960's. Join Andre Ethier on Sunday, July 28th for his Carne Asada Sunday fan get-together after that afternoon game. Fans have the opportunity to cookout with Andre Ethier and enjoy authentic Mexican Carne Asada presented by Chef Merito, the official seasoning of the Los Angeles Dodgers, after the game against Cincinnati. You will also get the opportunity to partake in a Q&A session with Andre Ethier and take pictures with the All-Star. Tcikets are $50.00 and it benefits the Union Rescue Mission. Attendees will also get a Dodgers gift bag. Go here for more information. I'm a little bit troubled by this. Via Jeff Passan on Yahoo, Jay-Z is apparently courting Yasiel Puig to join his sports management group. I would prefer Puig focus on Baseball instead of marketing. If he continues to perform at the level we hope, I am certain endorsements will come - not that he needs any. Bill Plaschke at the LA Times writes, "Someone to watch over Yasiel Puig: The most important member of the Dodgers' lineup? 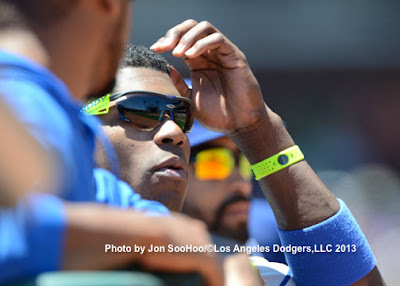 It's Tim Bravo, who watches over hard-living rookie phenom Yasiel Puig day and night." Left Field Pavilion makes an awesome fantasy card of Yasiel Puig using the vintage 1958 Topps All-Star card design. It looks like the team and new Dodger owners are getting the fans stamp of approval. Via a tweet from the @DodgersPR. BTW, this tweet refers to Tuesday night's game. 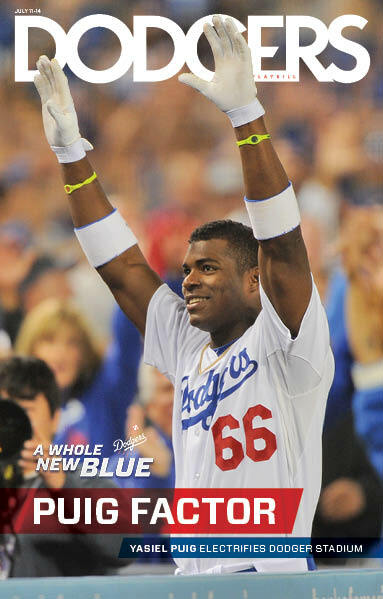 The cover of the 8th edition of the 2013 Dodgers playbill features Yasiel Puig. See it on the right. Via Hugh Bernreuter at mlive.com, "Los Angeles Dodgers prospect Leo Rodriguez opens eyes, leads Great Lakes Loons with .306 average". Via Ken Gurnick at MLB.com, "WWII vet Patterson is Dodgers' All-Star hero". David Patterson of Rio Rancho, N.M., will represent the Dodgers as one of 30 winners of the "Tribute for Heroes" campaign, a national initiative of MLB and People Magazine that recognizes veterans and military service members. 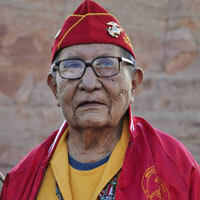 Patterson was awarded the Silver Congressional Medal of Honor and is a Native American who took part in every Marine assault in World War II as one of the Navajo Code Talkers. This is clearly the strangest news I've heard in awhile. Via Eric Stephen at True Blue LA, "Josh Beckett injury: Dodgers RHP has rib removed during surgery".